In the 1990s, a huge range of contemporary art was categorized into some simple themes. There was a quick consensus that “the body” and “identity,” “memory” and “home” defined the queries and struggles of our contemporary era, as if the big world was so complex—and overburdened by art theory—that we needed to recompose ourselves using these basic building blocks of human life. These efforts at categorization promoted some excellent art works. In the “home” or “place” thematic category, Rachel Whiteread’s 1993 “House” and Gregor Schneider’s “Totes Haus ur” (1985-2003, in various iterations) defined a new genre of residential manipulation, with roots stretching back to Gordon Matta-Clark’s 1974 “Splitting” of a suburban home right in half, although Whiteread’s and Schneider’s large-scale installations were more of an effort to reconstruct the single-family home rather than destroy it. The symbolism of the single-family home is resurging amid the American real estate bust, and a particular derivation is on view today in Chicago galleries. Where Whiteread and Schneider (and a host of others, including Do Ho Suh) investigated the site-specific qualities of “home,” the houses of today are generic and reduced to icons in the style drawn by children: a square with a triangle roof. As symbols, these houses are reductions to a universal essence of “home”; they speak about the safety of familiar objects, the comfort of domestic rituals and the fantasy of contained happiness. In children’s art therapy, each element of the drawn home signifies peculiar psychological underpinnings. In 2004, Teresa Szanto identified some particular traits: a house with a chimney symbolizes a warm relationship in the home; a chimney with too much smoke may signal internal strife; a long winding path that narrows toward the front door indicates a tendency for superficial happiness. Joseph Yoakum drew a very ordered house surrounded by a chaotic environment in his “Pleasure and Club House on Lake Placid near Sebring Florida on Indian Prairie Canal,” from 1964, on view at Carl Hammer Gallery. The square house with a triangle roof sits in the middle of the composition while rocks and the lake swirl around it. Yoakum’s fantastic landscapes are often depopulated, but houses do make an occasional appearance. This one has a pronounced stoop, inviting us in for the promised “pleasure,” and as a retreat from the threatening nature—a dead tree is snapped in half in the foreground. Chris Johanson’s new installation at Kavi Gupta Gallery features several relief sculpture panels that include residential homes. Composed of found and painted wood, the houses are presented in a crude, generic way. 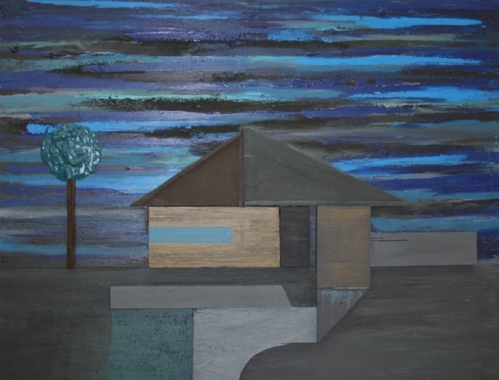 “Suburban Night Painting #2” shows the iconic rectangle and triangle home with a path that widens toward the door. The entirety of Johanson’s gallery installation presents objects and imagery in a raw and immediate way. There are stick figures and other reduced shapes, such as a circle for the sun. Johanson’s exhibition design, a skeleton of flimsy wood construction, supports the picture of a house as seen at night, which seems a particularly ominous or nostalgic perspective on the family dwelling. At Roots and Culture, Carol Jackson’s tall wall sculpture of stamped cowhide shows an overall image of a triumphant angel figure contained within a coffin. In detail, the embossed leather contains rows of houses butted up against each other to form a pattern. Smoke billows from the chimneys, creating a polluted landscape that’s interwoven with a claustrophobic (but texturally alluring) waffle pattern. This is not a happy house, but it is dense with feeling, the stuff of folklore. At Gallery 400, Stephanie Syjuco presents dozens of small objects that were digitally rendered by users of Google’s 3-D modeling program SketchUp and submitted to the artist, which she subsequently crafted by hand. Many of the objects resemble architecture, from fabulous utopian structures all the way down to our own single-family home, a shoebox with a pitched roof. The windowless, doorless house is an object of familiarity amid the neighboring jagged and arbitrary sculptural objects. By contrast, ArchiTech Gallery is exhibiting “The House: Drawings for Residential Architecture” by famed architects Frank Gehry, Richard Neutra, Frank Lloyd Wright, and many more. These blueprints and presentation drawings depict the furthest things from the generic child’s square-triangle house. They bespeak the originality and innovation of the Modernist tradition, which redefined the safety of familiar suburban life into something rarefied and strange. In the context of our house tour, they contribute a point of difference. The art world is often fascinated by site-specific installations, where the peculiarities of a place serve to detail bizarre case histories. This current collection of square-and-triangle house icons, though, adds up to something generic or universal, like the collective desire of children who ‘play house’ to grow up, or the regressive desire of adults to be swaddled and harbored, if only for the moment it takes to make a small drawing of a house.